Bigfoot | Sierra Nevada Brewing Co.
We did a 2009-2015 vertical. Each vintage was delicious, yet slightly different. The 2009-2012 had quite a biscuity flavor that the 2013-2015 didn't have. The 2009-2011 had a hint of caramel along with the biscuity flavor. Each year got a little hazier the older it was. Each year still had plenty of carbonation. For my first official Beer Advocate beer review, I’ve pulled out a special beer for a special occasion. This is the last 2013 Bigfoot Barleywine that I have been holding on to as my first attempt at cellaring/aging a beer. Thinking back to 2013 when I first bad this beer, I remember the strong and biting bitterness of the hops and warmth from the alcohol that overwhelmed my palate at the time. As time and experience with other beers have developed my palate, I am really looking forward to what time has done to this cornerstone of a beer for me. So here we go! Look: 12 oz bottle poured semi-aggressively into a tulip glass, a beautiful rich mahogany red with two fingers of a light tan head, a few floaties that have settled from aging. Tight and pillowy at first, the head dissipates to a half inch of larger soapy bubbles in the center and creamy froth around the rim after about five minutes, leaving wonderful lacing. Smell: Immediately caramel hits the nose, with very ripe dark fruits following. Hints of sweet raisins and port wine. Hardly any traces of citrus or piney hops. A completely different creature after 3 years. Taste: Caramel, cream, vanilla, leather, dark candied fruits. Maybe a nice mild aromatic pipe tobacco? The booze is nowhere to be found in such a big beer compared to its younger self. Only slightly resinous with a hint of mature pine. Really a lovely sweetness like a fresh warm fruitcake. The perfect amount of sweetness and balanced bitterness. Feel: So very smooth and creamy. Perfectly balanced and still a great medium carbonation. Such a soft and subtle bitterness that lingers on the middle and back of my tongue before disappearing like a dream. It coats the mouth and leaves a delicate bitterness aftertaste reminiscent of citrus, like subtle grapefruit pith. Overall: One of the most lovely beers I have ever had the pleasure to enjoy. The harsh bitterness and sharp edges from 2013 have smoothed and mellowed over time, making this a treat to enjoy on a stormy February evening. It is amazing what time can do to a beer. Being my first (and only at the moment) beer to have aged, I can’t wait to grab a few more bottles of various others to store away for another few years. While I would rate the young and raw version of this beer a 3.43, the 3 year aged version has blown me away beyond my expectations 5/5. I find it hard to believe that I’ve yet to review Bigfoot. So for my 1450th beer I am finally entering it into my ratings. This is THE barleywine. It’s a classic, and a standard of the style. Pours a wonderful warm malty-amber with a boquet that changes over time… from a orange/citrusy hop kick to a light toffee/toasted coconut. Big malt backing that develops toffee and chocolate notes over time as well, complementing the citrusy piney hop profile. I’ve had this fresh and I’ve had this aged and I love it either way. Just don’t drink it out of the bottle, ok? 2001: Hell yeah! A bit raw, but expected for such a young big beer. Lay this baby down for some years and you'll have a totally different beer ... but back to this one. Dark copper, with a nice patchy foam head. Killer aroma of aggressive hops with a citric sting. A very creamy and smooth beer. Flavour is initially overrun by hops (grapefruity, piney, salty, leafy and raw as all hell), then the big malt sweetness (a tad treacle-like) and alcohol flavours kick in to smooth things out. Fruity? yes. Oh, and by the way, the alcohol is very present, warming and dangerous. Treat this beer with the utmost respect ... sip and savour. Anyone look at the inside of the cap? Gotta love that image of 2 campers sitting down with BigFoot and having some brews over a campfire. Hell yeah! Delicious. My first barleywine brew to experience. Taste is perfect. From a bottled dated 12/11/15. Poured into a pilsner glass from bottle. Aroma, sweet floral notes, heavy malt. While my nose and palate are young and i have much to learn, this is a complex flavor and scent. I enjoyed this very much. Will probably by my local pub out and try to cellar a few. (If i can abstain from indulging in this powerful and delicious beer.) I havent had a beer from Sierra Nevada that has dissapointed and this is the cream of the crop. Beer Noob opinion, will buy again (: love it! I keep trying to like this beer. Its just not going to happen. Pours a reddish amber color with a slight head that recedes quickly. Smell is bittering hops. Strong and dominating. Taste is more the same. Cant even tell if the underlying barleywine is any good, because the hops are all thats there. I just dont get the fascination with this beer. I guess it cant be for everyone. I feel this is just a highly over-rated beer that I just cant figure out. I'm not a fan of this style generally, but I couldn't pass up on a 2014 bottle of this I found in a bottle shop. Body is a reddish mahogany color with a rocky, off-white head. Not much lacing or head retention here but I wouldn't expect that from a higher alcohol beer. Smells like over ripe fruit, caramel, and alcohol. Taste is super complex, I actually had some taste bud fatigue afterwards. Lots of dark fruit (raisins, plums), very rich caramel, wood, smoke, chocolate, leather...it's also much hoppier than I thought it would be, although I imagine some of that's faded by now. Getting some resinous and citrus type bitterness. It's overall extremely sweet, but the hops add enough bitterness to keep it from feeling too heavy. It's a good thing too, because this beer borders on a syrupy mouthfeel and needs all the lightening up it can get. Not unpleasantly syrupy in small doses (this isn't a beer you want to exactly chug anyway), and overall pretty smooth and creamy considering the ABV. Alcohol presence is definitely noticeable, a little like scotch. This is one of the more extreme beers I've tried and it isn't something I would want to drink more than once a year, but I can appreciate how intricate the flavors here are. 2013 bottle poured into a snifter. Aggressive pour produces minimal head, about a half finger thick, before dissipating into a thin white film. The beer is a striking mahogany color and looks wonderful in the glass. Oh my... BIG hop presence on the nose, very potent and piney. I've had IPA's that didn't smell this hoppy. I'm worried... I've never had the barleywine style before, but I was assuming it would have the dark fruit/caramel/brown sugar aromas of other dark, high alcohol beers. The mouthfeel is medium bodied and slick, with oily hop bitterness coating your tongue. After a few sips, I had to pour this down the sink, much to my dismay. This is the last time I base my beer purchases on reviews from BA, as my past 4-5 purchases have left me disappointed and wishing I had my money back. This beer was all bitterness and no flavor, a hop bomb. They should have called this a DIPA instead of a barleywine. I've heard that you can mellow this thing out by cellaring it for a year or so, but this is the last Bigfoot I will ever have. NOTE: Although I stand by my review scores and consider this undrinkable, I should have realized it actually does fit within the style of being very hoppy, as it is an American styled barleywine. American styled barleywines have a more aggressive hop profile than their English counterparts, and I failed to realize that at the time. 2015 12oz into an IPA glass. Look: beautiful amber caramel with a decent head. Smell: pine, caramel, something almost lime-like. Taste: wowza. Big, sweet malts reminiscent of an amped up marzen or something, but with a huge splash of juicy piney hops. Alcohol is present, but I think it adds rather than detracts. Feel: fluffy, medium-thick, and dry. Quite good. Overall: had this for the first time last year and didn't know quite what to make of it. Suffice to say, my palate has developed, and I think this is a damn fine brew. I'd put it alongside Lukcy Basartd in sheer kickassery, though this is a bit tamer. This is a well balance beer!! There is a ton of Barley (as expected) blended with a mild hoppy taste. Feels great in the mouth. Smells great in the glass. Nice tan head. Some sticky lace. Amber and cloudy in glass. Just a great beer. Will definitely buy it again. I have not had many barleywine style beers so I was eager to give this category classic a whirl. The beer had a pretty substantial amount of nice looking yellowed white head on top of the rich, well filtered auburn liquid below. Big boozy aromas of caramel and toffee commingled with a pronounced spruce note. The flavor was quite a bit more bitter than I was expecting. This was a fairly fresh 2016 bottle so the hop punch was definitely all up in my grill piece. I would love to get a few more bottles of this to let them age for a while. I want those hops to recede and let the malts shine a lot more. I'm also curious to know where Sierra nevada's rendition of the American barleywine fits in the style bucket. Are they typically quite bitter and hoppy or is Bigfoot an outlier? More delicious research must be done and I'm just the guy to do it. Look: Pours a beautiful dark orange red with a billowing three finger head of khaki foam. Smell: Dry dark red fruits like dates and raisins. Raspberries and cherries. Rich caramel malt. Orange pith and huge notes of pine resin. Notes of cotton candy. Taste: Hard to describe. Very astringent with notes of bitter pine sap and grapefruit upfront. The sweetness of the malt slowly creeps in - it's quite savory and chewy. Gradually the flavors of dark red fruits set in, revealing notes of strawberry, sugarplums and raisins. There's a delicious maple syrup/brown sugar presence too. Feel: Medium with light carbonation. Alcoholic. Overall: This isn't my go to style of beer, so take my rating with a grain of salt, but I do enjoy a nice Barleywine from time to time. This one makes for a good beer to slowly sip and savor over the course of an evening. On a side note, the barrel aged version is infinitely better. The time spent in the barrel rounding out some of the harsh edges and really elevating a "great" beer to the rank of "world class". Bottled on 12/18/2014. Sampled and reviewed on March 2, 2015. Poured from a 12 oz. bottle into a New Belgium snifter. Pours a dark amber/hazy ruby color with lots of bubbles. 2 finger off-white head of sticky foam. Smells of malt, raisins, grapefruit, honey, with a slight hoppiness. Mouthfeel is quite dense, almost like a stout. Taste is bitter hops, caramel, bready malt, and grapes/raisins. I should add that as this beer warmed up, it became much more malt-forward when it hit my tongue. Very interesting evolution in a short amount of time. I get citrus and malt on the back end with a doughy aftertaste. This is probably once of the most balanced barleywines I've had so far. It's incredibly smooth and easy to drink for 9.6%. Hell, I'm on my second one and I just finished my dinner. I've always been a fan of Sierra Nevada, but this is my first go at their seasonal releases. I bought 1 four-pack. Now the only choice is to finish this glass and cellar the other two, or finish it off and cellar another 4 pack. Very good beer. Revisited in depth on 1/22/2016. Same batch (12/18/2014). Numbers adjusted. L. Murky brown, carbonation streaming up, light tan frothy head leaves a thick lacing. S. Molasses, burnt sugar, dates, caramely, Whoppers (the candy, not the burger). T. Bitter and sweet, and not shy in either direction. Toasted malts, dark caramel, molasses, some smooth bitter dark chocolate, grassy piney hops, big dates. Pretty scrumptious. F. Pretty full feel, smooth, sticky and resinous. Not boozy, only somewhat warming way in the end. O. At 10 months it has terrific balance. I'd buy it again. Cheers ! ! ! Just happened to have my computer while I was drinking a glass of this, so call it fate. Here goes my first official BeerAdvocate review. Look: Gorgeous just barely off-white and silky head sits atop. About an inch of head and isn't going anywhere soon. The liquid a deep ruby with brown tones. This is a beautiful beer! Smell: Some alcohol phenols and hops on the first sniff. Delve a little deeper and some dark fruits and maltiness pop up. Sweet and enticing aroma. Taste: A complex one on the tastebuds. First hit is that fresh-hop bite. As it moves over the palate the sweetness opens up and dark fruits (raisins, plums, figs) come to mind. After-taste has it giving way to how big this beer is, although well-hidden, as it warms your body. Overall: Couldn't be happier having this beer as my first official BA-review. Just a lovely offering on the style, and you can't ask for much more with how available it is. Sierra Nevada after all these years is still making some excellent stuff. Happy to store a few bottles each year to see how they age and develop. Maybe the best barleywine ale I have ever had. Not overly sweet. The sweetness is well-tempered by the bittering hops. Robust flavor that is well-balanced. One of my new favorites. It pours a mostly clear rich yet vivid brownish copper color with a dense tannish two-finger head. Aroma is big- huge hops (resiny, citrusy) dominate but they are backed up by lots of caramel malt. I also pick up a blackberry-and-cream quality, hints of cocoa and, of course, alcohol. Flavor is powerful- tons of malt and caramel at first, but the cocoa, berries and some nuts come right on afterwards. There is a gigantic bitterness cutting right through it all and there is a lingering finish of orange peel and alcohol. I'm loving this beer right now- some of its abrasiveness of youth is gone and that lets some more complex characteristics come through, yet there is still some fire there as well. Picked up a sixer of the 2017 bottles to tuck away in the cellar...when I realized I haven't had one of these fresh in over a decade, maybe closer to two. New label looks great and love the six instead of four pack. Pours a garnet, ruby body with a bubbly head. My god the aroma - huge hops (pine, grapefruit, spruce) and doughy malt. Forgot how hop-forward this is. Taste (after it warms a bit) is an upfront burst of pine, grapefruit, blood orange proceeding to candied fruit, honey, dark fruit and roasted malt. Finishes bitter with a good dose of alcohol heat and tobacco-tea like notes. A true beast of a beer that mellows with age. 2018 bottle into my trusty Big Eddy shifter. Beautiful reddish brown color with red highlights around the edges, with a very light tan head and some spotty lacing. Pine, citrus, toffee & fruit aromas. Taste starts out sweet and ends with a bitter finish. It has a medium body, and nice carbonation. Very nice beer. I purchased a six pack of the 2012 Bigfoot Barleywine Style Ale from Once Upon a Vine in Richmond, Virginia, on April 6, 2012. What followed was a worthwhile test of patience. After three and a half years later, this ale is absolutely superb. A (4.75): Poured into a tulip glass. Cloudy red amber color with a creamy white head tinged with the slightest bit of honey gold at its edges. The head dissipates quickly, leaving almost no lacing. When held to a light, the ale glows a rusty orange. S (5.00): Incredibly complex. While pouring, the ale surprises you with a strong malty sweetness with a good bit of cherry and spice. Upon further nosing, the hops that have been subdued over the past few years become evident; mostly piney but with the ever slightest hint of citrus. Alcohol hides behind candied fruit and honey, which certainly take center stage, starting (again) with cherry and working through raspberry and raisin to a sweet almost chocolaty allspice aroma. Everything is subtle and balanced. T (4.75): Fruit tartness is offset by a molasses sweetness. The taste is flat compared to the smell, but isn't disappointing. More candied fruit that turns into malty sweetness after warming. Molasses lingers on the tongue. M (5): Take the first sip quickly before the head dissipates for an incredibly smooth and creamy feel that dissolves into a slight dryness. The ever slightest bit of carbonation appear on the roof the mouth but not on the tongue. After the ale settles, there's a viscosity to it that doesn't offend, like very thin syrup. O (4.875): I wholeheartedly suggest cellaring this ale for at least 18 months. I haven't done a vertical, and I'm not sure how much longer it would have held on after 3.5 years, but it's definitely fantastic after some time to balance and mellow out. This is my first ever barleywine. I am very...hesitant about this style now. This was a lot hoppier than I was expecting - hops aren't bad of course, I do love my IPAs - but to me it was too overpowering on the bitter, piney hops. The malts do give it just a bit of a bittersweet flavor to it, and there's an interesting almost raisiny after-taste, but to me it feels unbalanced and too intense on my palate. It does look awesome - a deep red color with a head that never dissipated as I sipped it down. It also hides the alcohol well for 9.6%. I couldn't possibly say this is bad. I don't know how well it represents the style, but it's obviously a well-made beer. I just don't think it's for me. 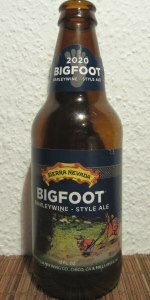 Bigfoot from Sierra Nevada Brewing Co.